Made of 600D nylon material this double ball wheeled bag features a retractable handle, large side accessory pocket and separate shoe compartment. 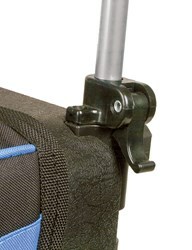 End stand allows bag to stand securely upright. Plus there is a 5 year manufacturer's warranty, you can't beat that! Well built, more than enough storage for balls, towel, shoes, etc. Only drawback for me is the wheels are on the small side, making rolling a bit unstable and also it would be easier to navigate stairs with larger wheels...Still satisfied overall and it is a good value for the money in my opinion. By will from clarksburg md. Not sure how the latch works on the handle. I think it locks it in place. Would be good to have instructions on it. Otherwise, a nice bag for the price. Has the velcro strap to hold it in place. By Felixjuan from Calhoun , Ga. This was a good buy for me ! 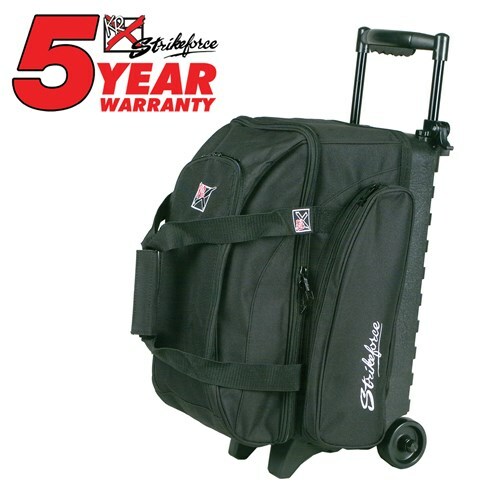 Enjoy the size, easy to use and place in the trunk of my car, like the way it stands, have one issue and that is the size of the wheels they need to be a little larger, other then that it's a great little bag. 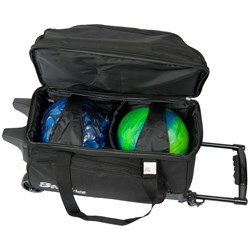 I use the bag for league bowling. It stays standing even when fully loaded. Holds two balls and a pair of shoes without a problem. Side pocket is a little small but big enough to hold wrist brace and a towel. It feels like it is made out of a tough nylon with metal zippers. It should last for several seasons. Big enough to hold everything, but loses balance really easy when rolling. I often have to stop so it quits rocking before I can continue. Also the front pocket is really tight and can't hold much, but the side pocket is very roomy. There are no aftermarket wheels for this bag. Due to the time it takes to produce the KR Strikeforce Eliminator 2 Ball Roller Black ball it will ship in immediately. We cannot ship this ball outside the United States.